May 9, 2008. Brussels, Belgium – SKYbrary - a new wiki-style web site which aims to be the single point of reference for aviation safety knowledge was launched today by EUROCONTROL in partnership with the International Civil Aviation Organisation (ICAO) and the Flight Safety Foundation. SKYbrary provides in-depth information for aviation professionals, backed-up with an attractive search engine. It already hosts some one thousand articles, covering fifteen areas, including critical safety issues such as Level Bust and Runway Incursions. Articles are added regularly, and search words inside the articles link to additional information both on SKYbrary and on external sites. The wiki format means that visitors can contribute both articles and information to SKYbrary. An open discussion forum aims to enhance visitors’ awareness of and interest in safety. 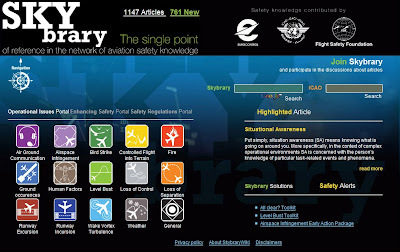 With permission from ICAO, SKYbrary includes an ICAO search engine. This will increase the speed at which answers to queries can be retrieved. As of today, key documents including ICAO Annexes (2, 10 and 11) and Documents (4444 and 8168) are included.